Aga Khan II Awas the title of Aqa Ali Shah (Persian: آقا علی شاه; transliteration: Āqā ‘Alī Shāh) (b. 1830 in Mahallat, Iran; d. August 1885 in Pune, India) the 47th Imam of the Nizari Ismaili Muslims. A member of the Iranian royal family, he became the Imam in 1881. During his lifetime, he helped to better not only his own community, but also the larger Muslim community of India. He also served on the Bombay Legislative Council and as President of the Muhammadan National Association in India. Although he was only Imam for four years, he did much in this short period to build on his father’s legacy of consolidating the community's trans-national organization. His own son, Aga Khan III who stressed the need for a progressive understanding of Islam would re-situate the community as a movement within the Muslim mainstream, and also raise the profile of the Aga Khans on the international arena becoming President of the League of Nations. His own successor has founded one of the largest development agencies in the world while other members of the family have given distinguished service to the United Nations. The legacy of Aga Khan II is one that stresses compassion for all, human dignity and service to the wider public. Aqa Ali Shah was born in 1830 at Mahallat in Iran. He was the eldest son of Aga Khan I and the only surviving male issue of his father with Sarv-i Jahan Khanum (d. 1882). Aqa Ali Shah was a member of the Iranian royal family, as his mother was the daughter of Fat′h Ali Shah, the second ruler of the Qajar dynasty. His rank as a prince of the royal family was also recognized by Nasser al-Din Shah Qajar when Aqa Ali Shah's father died. Nasser al-Din himself carried out a ceremony performed among Persian princes to mark the end of mourning of deceased relations. In addition, Nasser al-Din sent a robe of honor and the emblem of the Persian Crown studded with diamonds to Aga Ali Shah as a sign of the Shah's relationship with the Aga Khan's family. On his father's side, Aga Ali Shah traced his ancestry to the Prophet Muhammad, through his daughter Fatima and his son-in-law Ali b. Abi Talib. He also descended from the Fatimid caliphs of Egypt. He spent his early years in Mahallat; however, his father’s attempts to regain his former position as governor of Kirman made residence there difficult, and so Aqa Ali Shah was taken to Iraq with his mother in 1840. There he studied Arabic, Persian, and Nizari Ismaili doctrine and soon gained a reputation as an authority on Persian and Arabic literature, as a student of metaphysics, and as an exponent of religious philosophy. In the late 1840s, changed political circumstances allowed Aqa Ali Shah to return to Persia where he took over some of his father's responsibilities. In 1853, Sarv-i Jahan Khanum and Aqa Ali Shah joined Aga Khan I in Bombay. As his father's heir apparent to the Ismaili Imamat, Aqa Ali Shah frequently visited various Ismaili communities in India, particularly those in Sind and Kathiawar. The Ismaili Imams trace themselves back to Muhammad through his daughter Fatimah and her husband, Ali. The Ismailis, as they became known, who are Shi'a split from the majority of Shi'a after the death of Ja'far al-Sadiq when they chose Ismail bin Jafar as their 7th Imam, while the majority chose Musa. The Ismailis, like all Shi'a, often lived as a minority under Sunni rule keeping their identity and that of their Imam a secret. However, under the Fatimids in Egypt, when they were rivals of the Abbasids, the Ismaili Imams were able to reveal their identity. Several schisms took place during the history of the Ismaili community, which dispersed following the collapse of the Fatimids. That was the last time that Ismaili Imams exercised political as well as spiritual authority. After the collapse of the Fatimids, the Nizari lineage of Imams took refuge with the mini-state at Alamut led initially by Hasan i-Sabbah (1090–1124) where for some time their identity was again hidden, until Imam Hassan II, the 23rd Ismaili Imam who died in 1166. The line appears to have settled in the province of Kirman, Persia in the fifteenth century with the 29th Imam. Later, they took part in the administration of the province and one Imam married a Persian princess. The term "Nizari" is from the name of the 19th Imam, Nizār ibn al-Mustanṣir billāh, son of al-Mustansir, who died in prison 1094. He was not recognized by the Mustaali, who broke away under a different succession. The Nizari succession of Imams continued down through the centuries; they are regarded as inspired and as infallible by their followers. He is known as the "present" (or living Imam), since the 12th Imam of the majority of Shi'a, who went into "occultation" in 940 C.E. and is referred to as the "Hidden Iman." In theory, the Iman's authority is "absolute; in practice it covers religious and community matters." It was Aga Khan I who did much to revive the authority of the Imam through consolidating his position as leader not only in India but throughout the Ismaili Diaspora, using the trade links enjoyed by his Indian followers to strengthen international links and to shape the community as a trans-national religious, social and cultural organization. 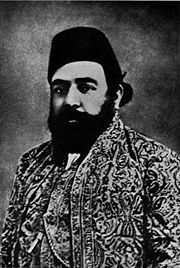 Aqa Ali Shah became Imam of the Ismailis upon the death of his father in 1881, also inheriting his father's title of Aga Khan. Aga Khan II maintained the cordial ties that his father had developed with the British and was appointed to the Bombay Legislative Council when Sir James Fergusson was the governor of Bombay. This was a noteworthy achievement, given that service on the council was restricted to people whom the British considered to be of outstanding ability who wielded influence in their communities. His son, who became President of the League of Nations, continued this tradition of public service. Imam Aqa Ali Shah also inherited his father's concern for his followers and was well-acquainted with their needs, having been assigned by his father to the duty of visiting the various communities in India. For example, when confusion had arisen due to the fact that some of this followers in India were governed partly by Muslim law and partly by Hindu law, he was appointed a member of a commission in 1874 which was constituted to submit proposals for amendment of the law relating to his community. Being concerned about the welfare of his followers, he also opened a number of schools for them in Bombay and elsewhere, and provided financial assistance to families in need. Although his imamate lasted only some four years, he was able to increase contacts with his followers living outside of the Indian subcontinent, particularly those who resided in the regions of the upper Oxus, Burma, and East Africa thus consolidating the community's trans-national organization and sense of identity. This built on his father's legacy. The move from Persia to India was in this respect fortuitous, because it enabled the Imams to make good use both of the Indian community's trading links and also of their own good standing within the British Empire to maximize use of the colonial network. Imam Aqa Ali Shah was held in high esteem by the Indian Muslim population, a result of the improvement in the conditions of his own community, his policies, and his social activism. He was elected president of the Muhammadan National Association, a position that he held until his death. In his capacity as president, he was also involved in the promotion and organization of educational and philanthropic institutions which served to improve the lives of members of the greater community of Muslims in India. Like his father before him, Imam Aqa Ali Shah maintained close ties with the Nimatullahi Sufi order. This relationship was no doubt facilitated by the common ‘Alid heritage that Aqa Ali Shah and the Nimatullahis shared: both Shah Nimatullah Wali (d. 1430-1), the eponymous founder of the order, and Aqa Ali Shah traced their ancestry to the 6th Shia Imam Ja'far al-Sadiq and, hence, to Ali. It appears that the affiliation between the Nimatullahis and the Nizari Imams can be traced at least as far back as the eighteenth century to the 40th Nizari Imam, Shah Nizar, who had close connections with the order. Prior to going to India, Aqa Ali Shah had developed close relations with the leader of one of the Nimatullahi branches, Rahmat Ali Shah, who had been a guest of Aga Khan I in Mahallat in 1833. After Rahmat Ali Shah's death in 1861, Aqa Ali Shah often sent money from India for the recitation of the Qur'an at his grave in Shiraz. Aqa Ali Shah also had close ties with Rahmat Ali Shah's uncle as well as one of Rahmat Ali Shah's successors, Munawwar ‘Alī Shāh (d. 1884). Aqa Ali Shah received a number of important visitors belonging to the Nimatullahi order, including Rahmat Ali Shah's son Muḥammad Ma‘Ṣūm Shīrāzī, who visited India in 1881 and stayed with Aqa Ali Shah for a year. Another prominent figure of the Nimatullahi order received by Aqa Ali Shah was Safi Ali Shah, who first went to India in 1863 at Aqa Ali Shah's invitation. Not much is known about Aqa Ali Shah's first two wives, both of whom died in Bombay. His first marriage with Maryam Sultana produced two sons. 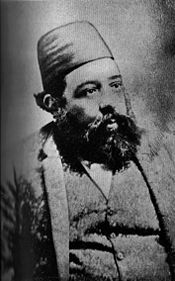 The eldest, Shihab al-Din Shah (also known as Aqa Khalil Allah) was born around 1851-2 and wrote some treatises in Persian on Muslim ethics and Ismaili spirituality. He died in December 1884 of a chest complaint while still in his early thirties, and was buried in Najaf. The second son, Nur al-Din Shah, who was the full-brother of Shihab al-Din Shah, died around 1884-5 in a riding accident at Pune while still in his youth. It was said that, having lost two of his sons, Aqa Ali Shah died of a broken heart. After the death of his first wife, Aqa Ali Shah married a second time, but lost his second wife as well. In 1867, Aqa Ali Shah took as his third wife Shams al-Muluk, the daughter of Khurshid Kulah Khanum (one of the daughters of Fat′h Ali Shah Qajar by Taj al-Dawla) and Mirza Ali Muhammad Nizam al-Dawla (a nobleman of great influence in the Persian court). Shams al-Muluk was also the niece of Muhammad Ali Shah of the Qajar dynasty. From his marriage with Shams al-Muluk, who came to be known as Lady Ali Shah (d. 1938), Aga Khan II had three sons, two of whom died in their infancy. His only surviving son and successor was Sultan Muhammad Shah. Aqa Ali Shah's father began the family tradition of racing and breeding horses in Bombay. The first Aga Khan owned some of the world's finest Arabian horses, which were inherited by Aqa Ali Shah. Aqa Ali Shah was not only a skillful rider, but also an avid sportsman and hunter, and was particularly famous for his hunting of tigers in India. He was known to have pursued tigers on foot and to have had such a deadly shot that he bagged at least forty tigers in this manner. On one particular day of water-fowling near Pune in 1885, Aqa Ali Shah contracted pneumonia. He died eight days later, after an imamate of four years, and was buried in the family mausoleum in Najaf on the west bank of the Euphrates, near Kufa and the tomb of Imam Ali, one of the holiest places in the world for Shia Muslims. The mausoleum is also the resting place of Aqa Ali Shah's grandfather, Shah Khalil Allah, who was the forty-fifth Imam of the Nizari Ismailis, and for whom the mausoleum was first constructed. The untimely loss of his father, Aqa Ali Shah, so soon after the loss of his brother, Shihab al-Din Shah, must have been heartbreaking for the young Sultan Muhammad Shah, who was only seven and a half years old at the time. The sad event also evoked much grief within the Muslim community. Aqa Ali Shah was remembered fondly for the work he did towards the betterment of the community, and also as an intrepid horseman and hunter and a legend in his own lifetime. He was succeeded by his son Sultan Muhammad Shah, who became Aga Khan III. Aga Khan III continued the philanthropic work of his father, founding schools, colleges, clinics, hospitals and funding welfare initiatives around the globe. He also entered the international arena, becoming President of the League of Nations and one of the founding fathers of Pakistan. Aga Khan III did much to situate Ismaili Islam as a movement within mainstream Islam. In this, he built on his father's good standing within the wider Muslim community in India. ↑ Prince Sadrddin Aga Khan (1933-2003) was High Commissioner for Refugees 1966-1978 and Prince Amyn Aga Khan works for the UN Department of Economic and Social Affairs. ↑ Daftary (1990), pp. 439, 463, 498, 504, 516-18. ↑ Naoroji M. Dumasia The Aga Khan and His Ancestors: A Biographical and Historical Sketch (Bombay, IN: The Times of India Press, 1939), 60-62. ↑ Bennett 1998, pg. 163. ↑ 5.0 5.1 Daftary 1990. ↑ Nasrollah Pourjavady and Peter Lamborn Wilson, "Ismā‘īlīs and Ni‘matullāhīs," Studia Islamica, 1975:41:113-35. ↑ Willi Frischauer, The Aga Khans (London, UK: The Bodledy Head, 1970, ISBN 0370013042), 50-54. ↑ Stanley Jackson, The Aga Khan: Prince, Prophet and Sportsman (London, UK: Odhans Press, 1952), 17-18. ↑ Qayyum A. Malick, His Royal Highness Prince Aga Khan: Guide, Philosopher and Friend of the World of Islam (Karachi, PK: The Ismailia Association, 1954), 41-42. This article incorporates information from the 1911 Edition of the Encyclopedia Britannica. History of "Aga Khan II"
This page was last modified on 7 February 2019, at 15:46.